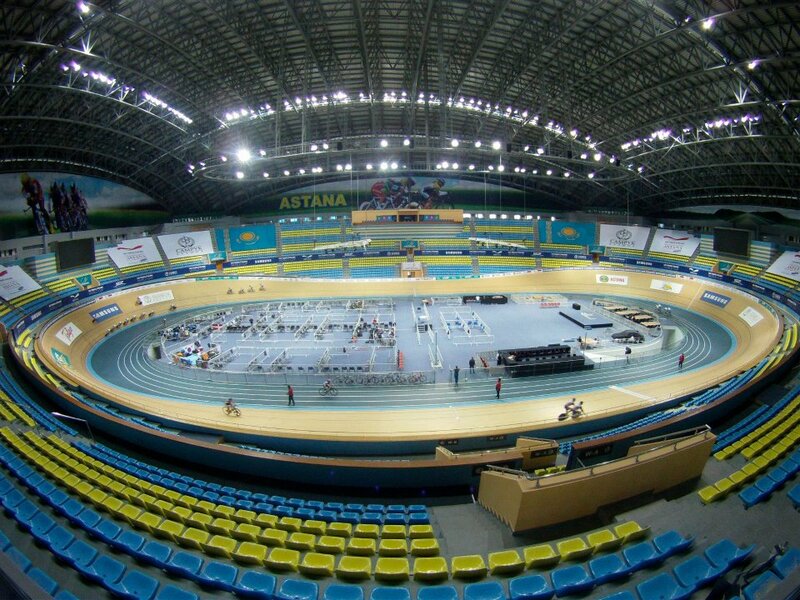 Last week, I flew halfway around the world to attend the first UCI Track World Cup in Astana, Kazakhstan with the Canadian National Track Team. The Canadian squad for this competition was comprised mainly of development riders, and as I had never attended a World Cup, I was eagerly awaiting the chance to step out onto the track and brush elbows with the worlds' best. Unfortunately, actually getting on the track in the first few days would prove more difficult than I had anticipated, as none of the Canadian team bikes made it to Astana until the Wednesday prior to competition. Monday was spent riding rollers in the hotel basement on US Sprint Coach Jamie Staff’s road bike (turns out one size does fit all! Thanks Jamie! ), and then on Tuesday the entire team was outfitted with some rental bikes, courtesy of the velodrome. I did my first lap on an ill-fitting Cinelli Vigorelli (a la Tegan), but even with the worn out chain and slightly out-of-true wheels, I could tell that the track (dubbed by UCI prez Pat McQuaid as the "most beautiful velodrome in the world") was going to be the fastest one I've ridden yet. By Wednesday, I was well-rested and raring to go, so upon getting the excited phone call that our bikes had finally arrived, the entire team piled into the first shuttle bus to the track. Our mechanic, Sandy, and team manager, Jonny, had the bikes built and ready to ride in record time, so without further ado, we all hopped up on the track for some warm up efforts. Thursday was race day – the Women’s Team Pursuit qualifiers were first up, and the Canadian team of myself, Jasmin, and Julia Bradley was the last team to start. With very minimal time spent practicing together, and only one training session on the track prior to the race, we rode a good race and more importantly, gained valuable experience for our next international competition. The next evening, after watching the opening ceremonies from the Team Canada pen, I was up on the track again for the Points Race final. This was my first big mass-start race, and I was very motivated to ride hard and get a good result for the team. After winning the first sprint, taking 3 points in another, and then gaining a lap with a small group, I was well-placed for a podium position. Unfortunately, with 8 laps to go I was caught up in a crash and didn’t score points in the final sprint, finishing the race 4th overall with 28 points. I was disappointed initially, especially after sitting in second place for most of the race, but I’m very happy to have finished in the top five at my first World Cup. I'm back in Victoria now, and realizing the extent of my injuries a little bit more now that the excitement of racing has worn off. Unfortunately, I fractured my pelvis in two places during my crash, and I will be taking the next few weeks off the bike to recover. 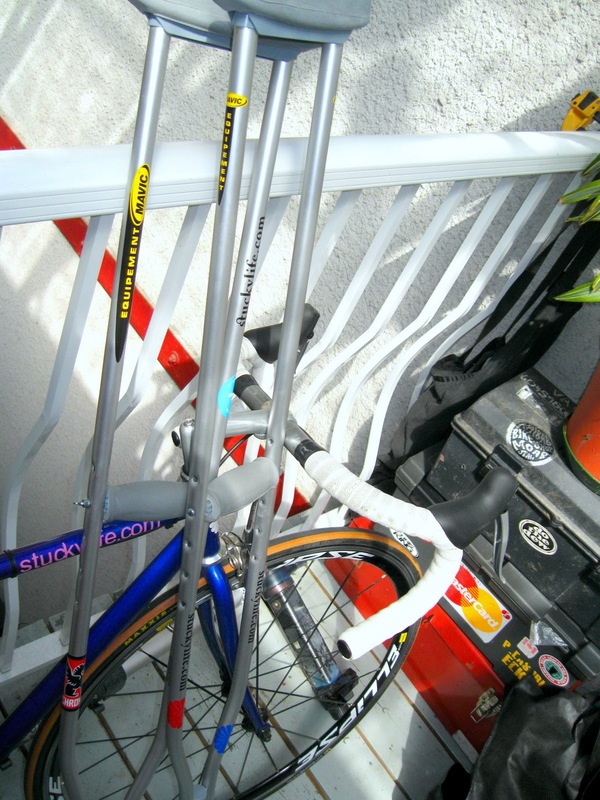 However, I'm already hopping around on crutches (much to the dismay of everyone who wants me to get off my feet and rest) and attempting to do some mild core/upper body work, so it's not all bad. Huge thanks to our mechanic Sandy Gilchrist, team manager Jonny Evans, videographer Steve Sleep, and coach Richard Wooles for taking care of every last detail and allowing me to focus only on racing and making the most of this incredible learning experience!